A Cat Named Haiku is an ongoing full-color comic series written by Mark Poulton, illustrated by Dexter Weeks, and publish by Arcana Studio. 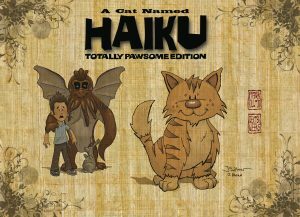 Well now they’ve released the first hardcover collection called A Cat Named Haiku: Totally Pawesome Edition. Here’s what they say: “A Cat Named Haiku tells the story of a mischievous little cat, as he learns valuable lessons on love and friendship told completely in haiku. Collecting A Cat Named Haiku volumes 1 and 2, select haikus from the Furrever Friends Anthology, and the all-new Cthulhu Loves Kittens story.” You heard it here. In case you don’t remember: A “haiku” is a Japanese form of poetry that is always 17 syllables long. Read all about it.